Looking for a high quality, printable blank certificate for an event? Look no further! Our Desktop Publishing Supplies brand 28lb Gold Border Certificates are what you need. Our border certificates are completely blank and printer compatible, allowing you to customize your certificate for whatever type of award you want to present. And, these certificates are made from a high quality 28lb Bond paper stock. 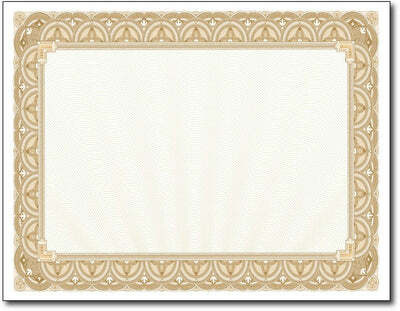 These blank gold border certificates measure 8 1/2" x 11" and feature a writing space of about 5 1/2" x 8 1/2". A Golden Wave background adds even more character to your certificate! These printable blank certificates are made from a 28lb Bond (105 gsm) White Matte Stock that is inkjet, laser, and copier compatible.